To begin with, apologies for the site being down yesterday - all thanks to the service provider, it turns out. Needless to say, they have fixed their problems and we can return to more important matters. BMW for instance. Nick Heidfeld has been playing down their championship chances for 2008 yet again, insisting that they don't really expect to be challenging the top teams for another year at least. I can't help but feel that Nick is perfectly suited to Mario Theissen's team, so closely does he echo the company line of cautious and underplayed optimism. It is refreshing to hear such quiet modesty from anyone in F1. Listen to the other teams and you would think that the podium is going to be very crowded next year, with all sorts of unlikely constructors and drivers jostling for places. And BMW standing to one side, happy to pick up whatever crumbs are left. Do not believe it for one second; this is an ambitious and determined team who are aiming at race wins as soon as they can get them and, if that means 2008, then they will seize them willingly. The caution is merely to cover any embarrassment if things do not go quite according to their real hopes. It's a wise policy and emanates from Theissen, I'm sure. He brings a style and sobriety to the team that contrasts strongly with others. Consider Ferrari's near hysteria over the "spying" issue during the summer, Briatore's inflated and ridiculous comments at the time (that now threaten to backfire in his face), Toro Rosso's short-sighted rubbishing of their drivers followed by exaggerated hype of their replacements, and the unwillingness to compromise by the participants in the customer car issue. Out of all this, the impression is that there is only one team with feet firmly planted on the ground and a proper appreciation of their own importance in the world of F1. BMW are pure restraint and practicality. And that will pay off for them sooner or later. There is nothing that brings success quicker than stability of personnel, realism in self assessment and steady development of what works. BMW have it all and will make the breakthrough, almost certainly next year. The top teams are busily shooting themselves in the feet and leaving the gate wide open. I can see BMW preparing to sneak through with Red Bull close behind them (provided they don't hire Alonso). So keep telling us not to expect too much, Nick - we approve and know that the sights are aimed higher than you'll admit. And it will be a breath of fresh air to see you and Robert on the top step of the podium. F1 needs a bit of a shake up and this is the team to do it. Now that is a perfect illustration of Inverse Expectation Theory - tell everyone you don't expect to be on the podium, and then flatten everyone else (OK, Jenson Button, but it was a very good flattening) the moment you stick slicks on your car. Cool! Yes, a good sign, wasn't it? 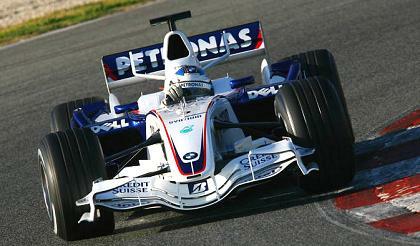 Nick Heidfeld taught me a lesson I wish others could see. So many are ready to throw Fisichella overboard, about 65% on one poll yesterday and I felt that way about Nick Heidfeld in 2005. When Sir Frank gave Pizzonia's seat to Hiedfeld, I was out-raged, Pizzonia was a chart topper when testing and had a fairly good record of four 7th places and one dnf (as a stand in driver), Heidfeld on the other hand was going backwards, scoring less and less points his last three years before securing his seat at Williams. What a difference a good car can make. I wish him (and Fisi) well in 2008. Totally off subject, but I don't know where else to ask: With Christmas coming, television commercials are hammering us with gift ideas, one of which is a Braun electric razor. Is that Mark Webber trimming his notable chin with that thing? Does/did Mark Webber do some modeling? Sorry to interject, but I'm just so curious about it.